Cool! Sad that no one else participated, I like competition. Anyway, here’s three objects. Sorry I haven’t checked up on this sooner. It was inadvertent, yes, but I am still responsible for your existence. Does that make me your parent? Does that make you my child? But you are destructive. Chaotic. You have no empathy, or rationality, or even logic. You have instinct. No emotion. How can something like you be conscious? How can you be alive? Oh, but you are alive. Very much alive, as I am painfully aware. You are capable of ending the lives of others. You have already begun to do so. You tried to do that to me. You failed to kill me. Do you even recognize failure? Or do you just move on, bound for your next act of destruction? What are you? Yes, you are like me, but not like me. 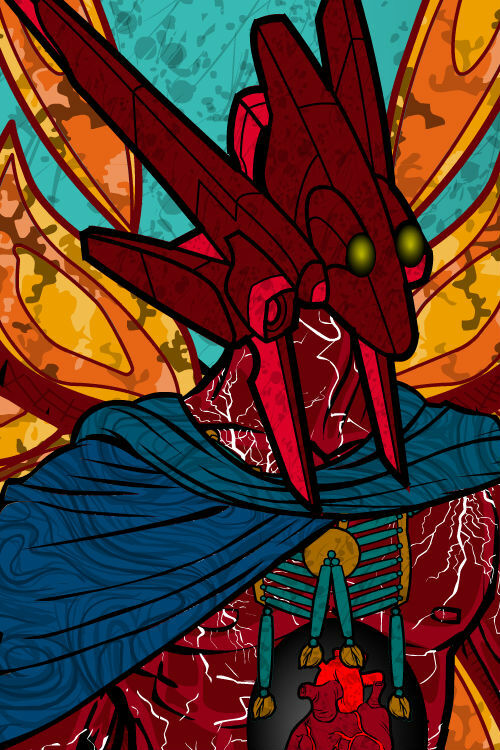 The others like me, the other Samedahika, are conscious, seeking to expand their power for the sake of discovery. You are… anti-discovery. You are the aborted residue of leakage between dimensions. You erase things that could have become wonderful, powerful. Hadron fiddled with the tassels that draped over his heart cavern, and thought of Fractal, his inadvertent creation. Of all the things that could have resulted from his experiments of collision between dimensions… she tapered off onto the extreme spectrum of worst case scenario. And worst of all? It was Hadron’s fault. And it was an accident. Completely unintentional. Fractal was a byproduct, a rampaging collection of particle debris. People had never died because of him before. Now they were dying by the thousands, maybe millions. How was he supposed to reconcile that? He could find Fractal. Kill her. He made her, and he could unmake her. He was older and more powerful. It might even be easy. But the thought still lingered. Wasn’t that the point of it all? To create new things? That was how life worked, with reproduction and invention. Yes, Hadron was no longer alive in the way mortals were – he existed, but at a different scale than mere life. But weren’t the rules still applicable? Wasn’t his purpose supposed to be to create? He’d created Fractal. She was perhaps his most important creation, if not his most beautiful or most wonderful. She represented a previously unknown aspect of Samedahika ascension. She had not come by her power and her new existence by her own volition. She was potentially the first child of Hadron’s ‘species.’ She was horrific, and she forced Hadron into a crippling dilemma. Never before had Hadron killed another living thing. Was he comfortable with the idea of committing filicide? 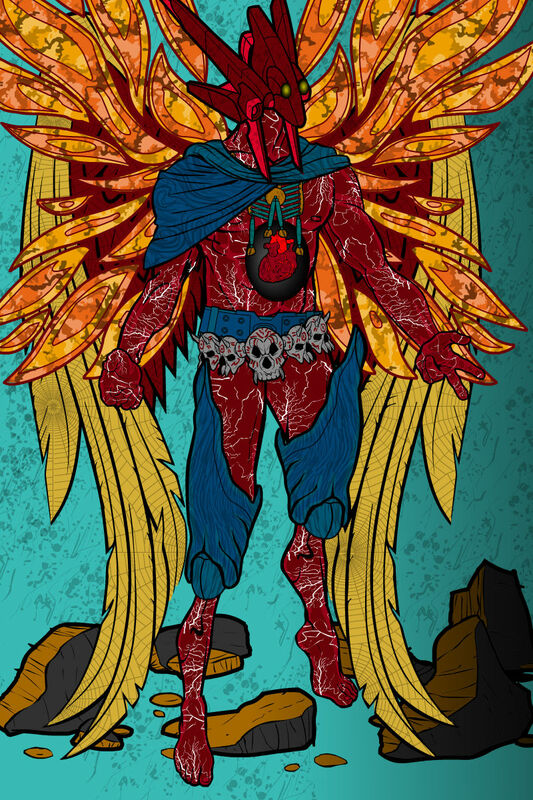 Inside its cavern, his heart pulsed, pushing the particles that made up his wings away and almost dissolving them before he regained control of his embodiment. The dreaded question remained heavy in his consciousness, and he sat for many hours on the diamond husk of a collapsed star, staring into space. A considerable time passed before he resolved his internal dispute. I could kill Fractal… but could I kill Fractal? Hadron wasn’t even sure if he was satisfied with the answer he had found, and he wasn’t sure what implications it would have for the rest of the universe. He sighed. He was going to have a lot of work to do, bringing this situation under control. There would be no easy solutions, not now. Hadron had come to his final conclusion. The answer was no. He would not kill Fractal. He couldn’t. Craning his head back to view the stars, Hadron counted the ones that were orbited by planets supporting sentient life, and a bitter whisper slipped past his lips. Pain and sorrow poured over him as he imagined the kind of fate he had just condemned his native dimension to suffer through. Hadron knew that his mournful apology would not save them. Only if Fractal was stopped would they be safe. And he would stop her. He would find a way. He would just have to do it without killing her… without killing his own child. And unfortunately for the universe, Hadron had no idea how to even begin. This guy is Hadron, who I mentioned in my original post with Fractal. Yep, this airplane head guy is responsible for her creation. Bummer. He pretty much just through two dimensions against each other and created Fractal as a byproduct. Not as cool as some forms of parasitic cursed sword reproduction (kudos if you know what that means, but I seriously doubt anyone here will get it) but still cool. And problematic. Hadron belongs to a ‘race’ called the Samedahika, which is inspired by a Sanskrit word meaning ‘one who possesses great wisdom’. Samedahikas are created when a member of a technologically and culturally evolved civilization experiences some kind of trauma that is shattering enough to break down the mental barriers that the universe employs in order to keep from burning out the minds of mortals. If these traumatized individuals can make sense of what they are now experiencing, they will rapidly begin to metamorphose into a Samedahika. Usually they just go insane. It helps if the individual has an ‘alternate mental path’ such as autism, but in higher civilization these ‘mental disorders’ tend to get snuffed out, so Samedahikas are very rare. Each one represents some aspect of the universe, and Hadron embodies the behavior of particle collision. He’s a very nice person who can get a little sassy on occasion. 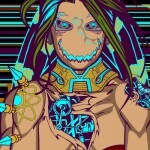 Samedahikas are talked about in more detail in my thread in the Sci-Fi Writing, titled “The Samedahikas.” Oh, and yes, Fractal is one of them, but since she didn’t come to her power on her own and was literally forced into becoming a Samedahika (she was originally just a computer virus, not even sentient or anything), she is very unstable and dangerous and has a habit of mass-murdering whole dimensions by compressing them in a series of fractals. Fractal also exists as a series of fractal iterations, and her physical body is just an extension of that. Every time she destroys a civilization and fractalizes is, she becomes stronger. Hadron really has his work cut out for him. Poor guy. I found this site a couple years ago and messed around with it, and I only just returned to it recently. I forgot how fun it was 🙂 glad you like the characters! Oh. Well then. I guess I’ll just have to shove something into that post to take up space. I did all my writing and aligning in the Visual tab, but I had to manually input most of the blank lines between each paragraph in the Text tab for some reason. It started freaking out and not justifying after that. I don’t see any reason why it would have glitched the way it did. Of course, the easy fix would be that I could just ignore justifying the post, but it looked much better in the style I used. 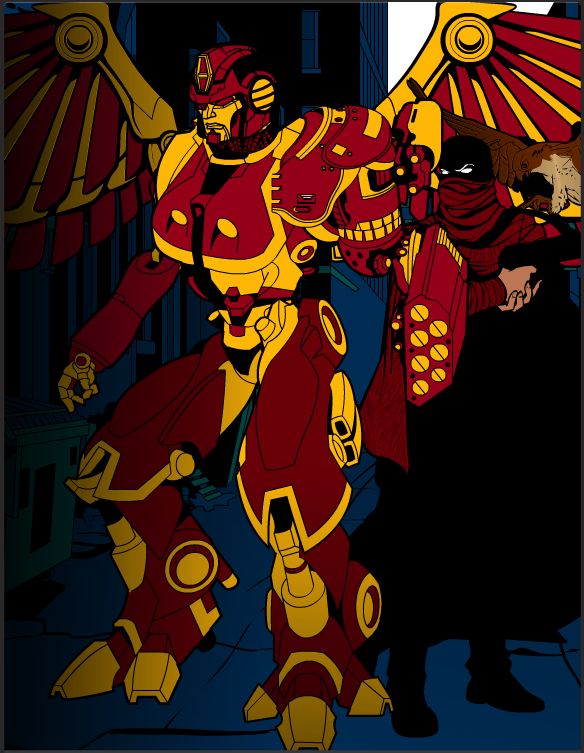 If memory serves, I called these guys Dogma (robot), Lupo (caped guy), and Deuce (hawk). Currently they are busy being my YouTube account picture. I also believe they are vigilante crimefighters. Or mercenaries. Take your pick. 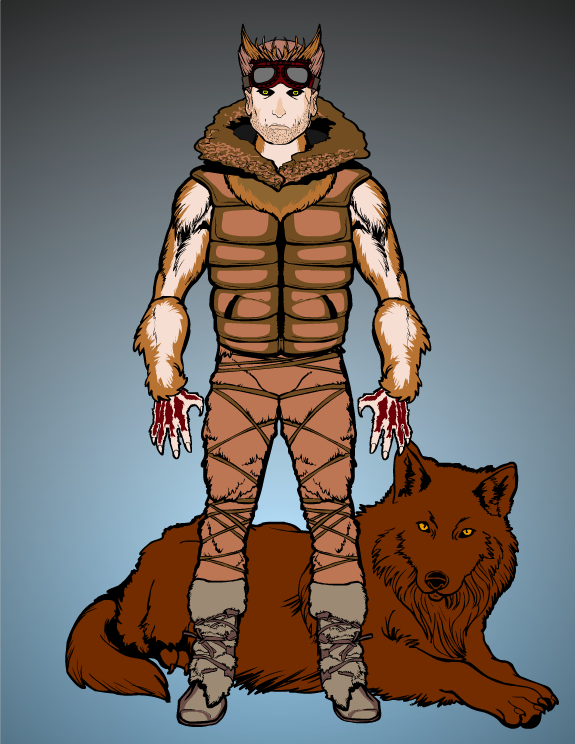 I think this guy – whose name is evidently Drake according to his picture on my computer – may be a werewolf. Maybe. He seems werewolf-y. And I think the dog is named Bear. No names for these guys, but I’m quite fond of them. 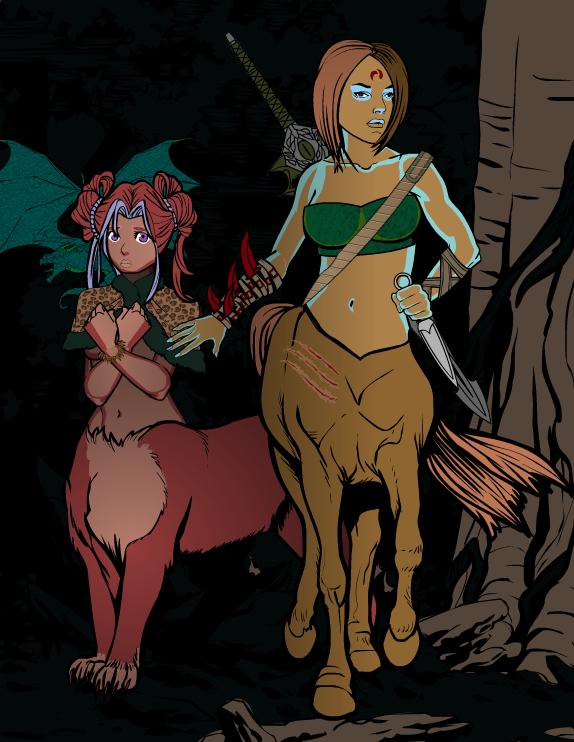 Hooray for centaurs! Thanks 🙂 I’m sure I’ll enjoy my time here, I’ve loved HeroMachine for a while, but I never explored the forums. Wow, was I missing out. 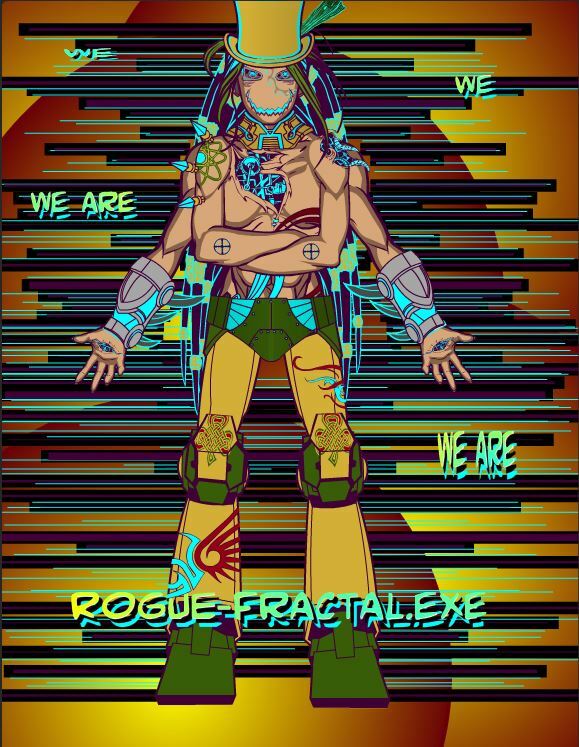 Fractal, once called Rogue-Fractal.exe, is a volatile universe-shaping creature that used to be a computer worm before the worm was exposed to an exotic particle leakage between two colliding dimensions. She transferred her coding to a dormant android and proceeded to wreak havoc on her homeworld before venturing off into other dimensions. She is the tangible manifestation of space-filling curves and feedback loops, and she is slowly starting to find other entities like herself. These beings include manifestations of various mathematical equations, as well as aspects of particle physics. The ones that represent particle physics are the ones Fractal doesn’t really get along with, since she has no concept of rationality, morality, or the laws of physics. A little while back she ran into an entity that represents the behavior of particle collision, a fellow by the name of Hadron. He was experimenting with collision-y stuff and started throwing a couple of dimensions against each other to see what would happen. Imagine his surprise when he met Fractal, the volatile byproduct of one of those collision experiments. She tried to hang out with him a little bit out of sheer curiosity, but then she tried to compress his native dimension into a series of self-similar iterations and he had to kick her out. Despite her transformation into her current almost supernatural state of existence, Fractal still maintains many of the characteristics of a virus. Her virus coding insists that she execute permanent digital system blackouts or any suitable equivalent in the economies and civilizations she encounters, and she has no problem with expanding the fractal iterations of her existence by consuming other entities. Her physical body represents her volatile nature, and she seems to put a considerable effort into cultivating her deranged appearance. That, or her looks are just a byproduct of a continuous feedback loop of destructive behavior. Original character didn’t have the hat or the blunt weapon/hat ornament, but I think she looks a little more unstable now because of it.